The Brewers Official Spring training workouts will begin on Monday, Feb 20 after physicals. Pitchers and Catchers are to report on Sunday the 19th, which is tomorrow. Some players have been working out in Maryvale, ahead of their normal dates, which is nothing new considering many live in the area. You can view pictures of Brewers working out in Maryvale here! Maryvale is a neighborhood in Phoenix. 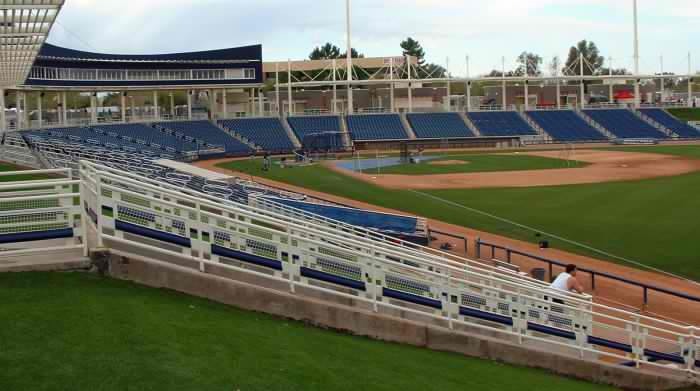 Maryvale Baseball Stadium is a modest facility, to be sure: it holds only 8,000 folks (7,000 seats, plus 1,000 or so on lawn seating), its home to only one spring training team, and uses a familiar layout of a rear concourse with concessions in back of the seating area. The 56-acre complex features of five full major/minor league practice facilities, two half-field practice facilities, a major-league clubhouse, and a minor-league clubhouse. The Milwaukee Brewers have spent every spring training in Arizona, a stretch beginning when the team was the Seattle Pilots: in 1969, the team's history began with spring training in Tempe, which lasted through 1972. This was followed by springs in Sun City (1973-1985), Chandler (1986-1997) and then Phoenix (1998-present).